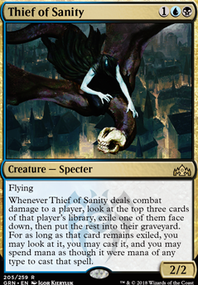 Thief of Sanity , the only guy who doesn't give a f*** to the opponent. Steal the opponent, get some cash, and bury him to the graveyard. Any suggestions are always welcome and important for me to step up and understand what can I use against or benefit.